Ruins of a small 13th C Carmelite church and monastery in Siah brook, on the west side of the Carmel. The Carmelites are a Catholic order of monks, one of the oldest in the Holy Land, and named after Mount Carmel. 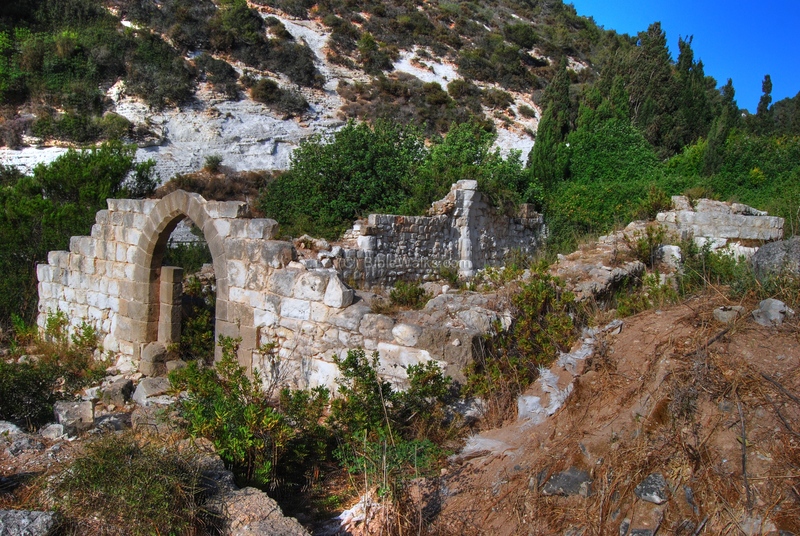 In about 1200 their first church (St. Brocardus) was built in the Siah (Siach, Siakh) brook located on the western slopes of mount Carmel. After the Arabs defeated the Crusaders, they were butchered and their church was destroyed. The survivors later emigrated to Europe, returned only in the 17th C to another area in Mount Carmel - Stella Maris. 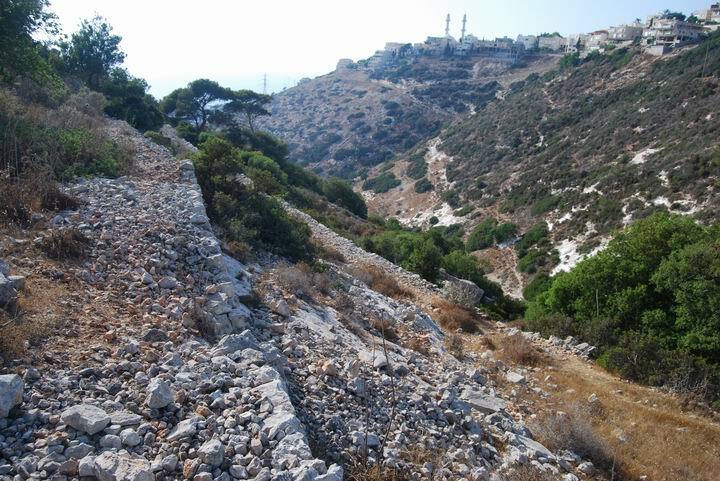 The ruins located on the west side of Mount Carmel, close to the new western entrance of the Carmel tunnel and the Haifa cemetery (seen on the right side). A road from the cemetery provides a close access to the site. The site is also accessible from a longer nature trail that starts from the upper side of the brook, near Herzel school on Lotus street. The following aerial view shows the location of the ruins. You can point on the purple points to navigate to the selected point in this web page. An early Bronze Canaanite period (3150-2200 BC) findings were found 200M to the west, in a cave on the entrance to Siah brook. 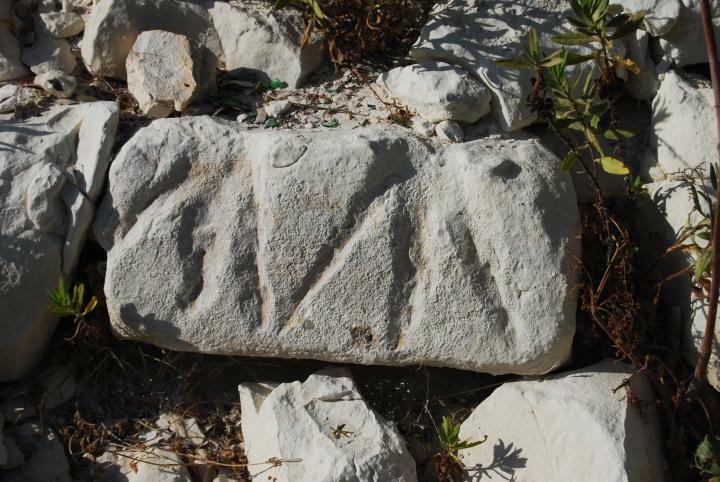 It was one of the few sites in the northern Carmel that were populated at that time. A Roman/Byzantine site existed at this area, according to archaeological survey. 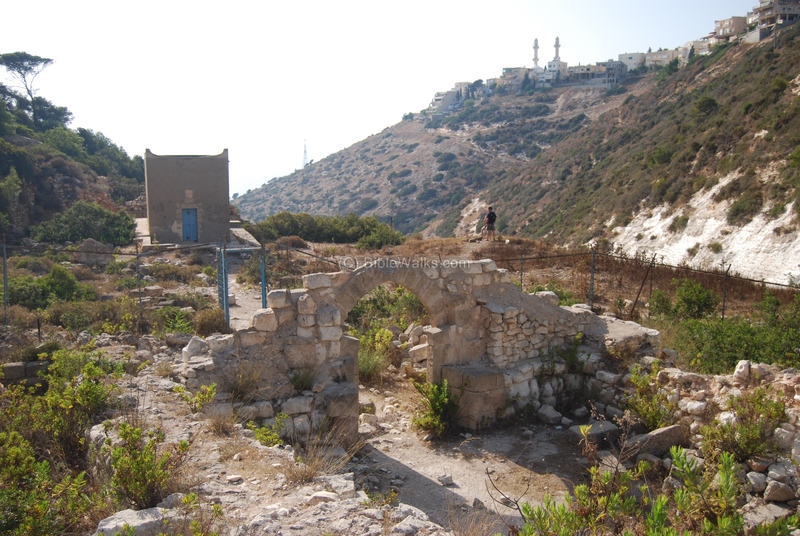 The Carmelite order was founded on Mount Carmel more than 800 years ago, starting from a number of Crusaders who went to seclusion in the caves on mount Carmel, and were inspired by the simple way of life of the prophet Elijah. These hermits were lead by the Frenchman Berthold (died 1188). In about 1200 their first church (St. Brocardus, St. Brocard) was built in a brook located on the western slopes of mount Carmel. 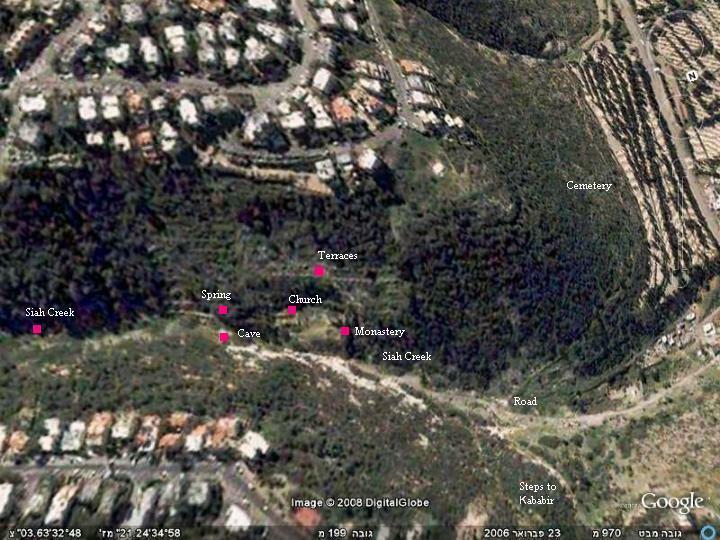 That brook is named e-Siah, now named Nahal Siakh in Hebrew, meaning bush. The church was named after the Carmelite leader, Brocard (pronounced "Brokar", 1207-1211). 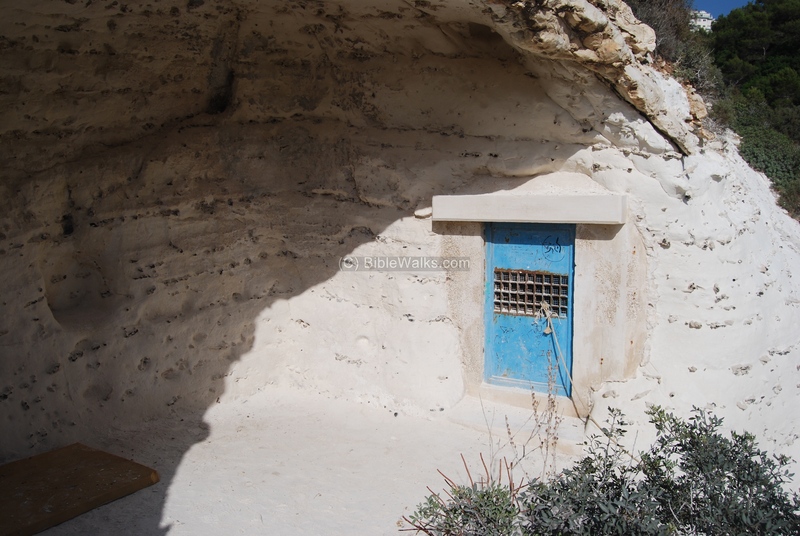 The hermits lived according to the directives that were formulated by the Italian St Alberto (the Patriarchate of Jerusalem and Bishop of two other cities; murdered in 1215). 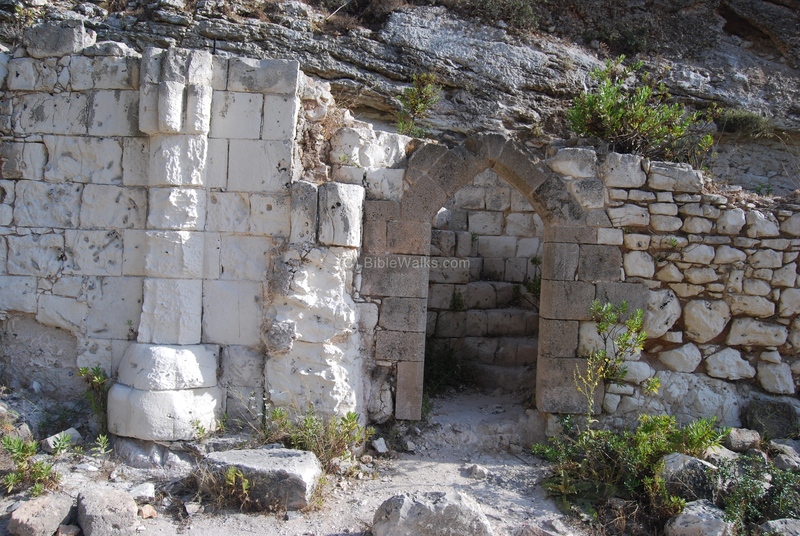 After the Arabs defeated the Crusaders, the hermits were butchered (1238) and their church was destroyed. The survivors later emigrated to Europe. In the 17th C the Carmelites returned to the place and built a small chapel on the western side of the ruins of their old church. 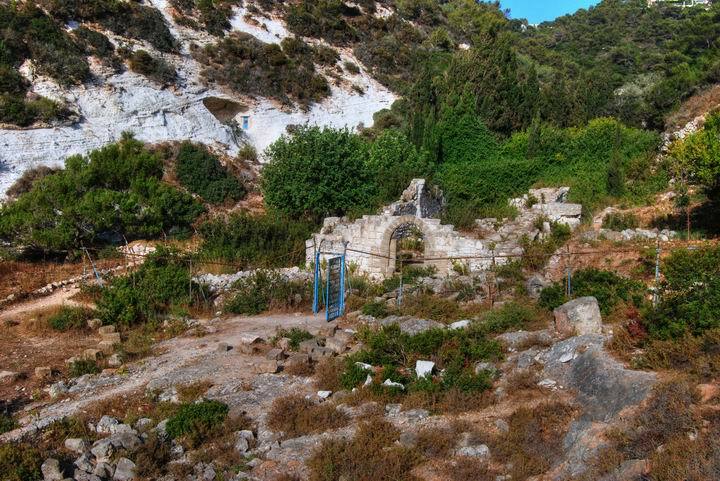 The hermits relocated to caves near Stella Maris and later established a new center - the Carmelite Monastery. The site is in ruins. 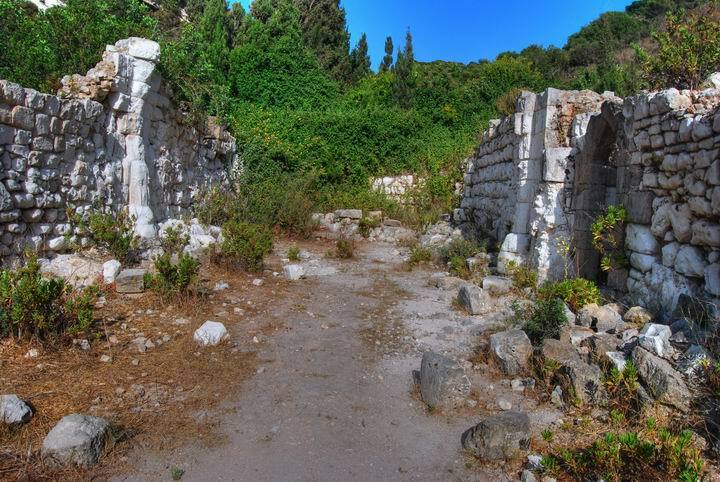 Some excavations and restoration were conducted by the Carmelites. Hikers come and visit the ruins and the spring. The site is open to the public and recommended for a short family hike. A drone view from the west side shows an overall view of the ruins of the monastery. The closer ruins are remains of a 17th Century monastery. Above the walls is a chapel of the same period. Behind, closer to the trees, are remains of the 13th Century Church, and behind it is the spring. A view from the east side is in the following drone view. The ruins of the monastery are on the left (south) side of the deep valley of the Siah Brook. The Carmel coast line, with a number of hotels along the beach, is in the far background. 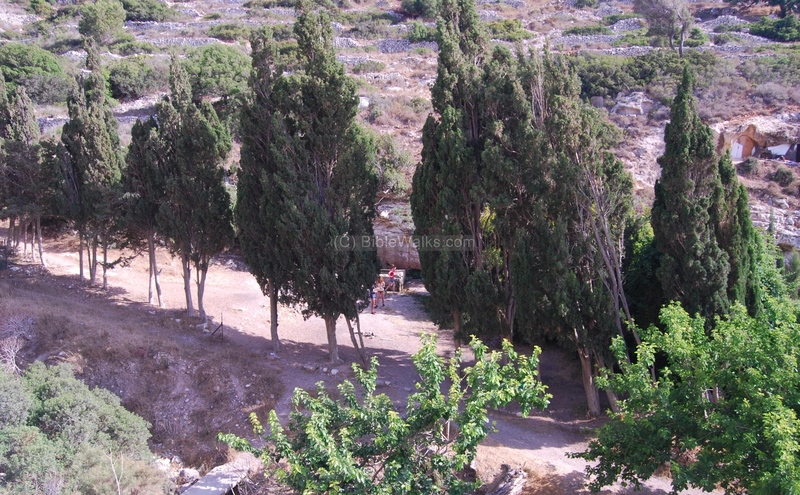 The photo below shows a view of the site from the top of the hill on its south side. The ruins are located on the bottom of the Siah brook, on the south side of its dry bed. 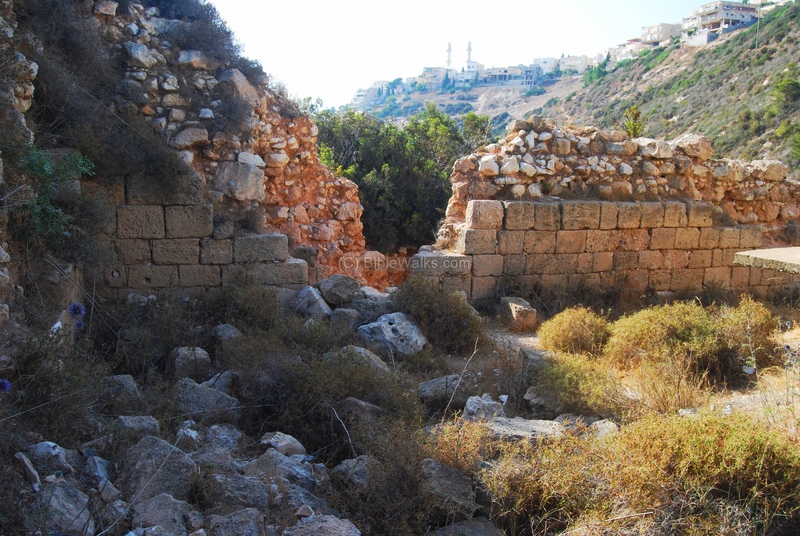 The ruins of the church are located in the center of the site, as seen below. In about 1200 the first Carmelite church, named St. Brocardus, was built here. After the fall of the Crusaders, the monks were butchered and their church was destroyed. 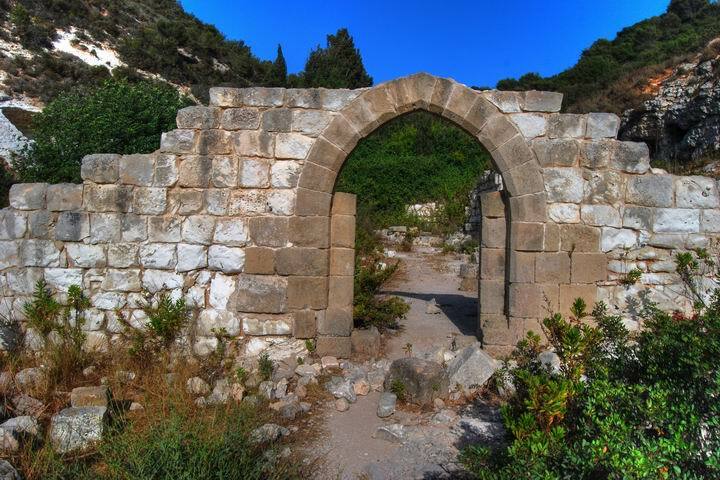 The photo below shows the western entrance to the church. A closer view of the arched entrance. The church was based on two sections - an entrance hall on the western side, and the church on the eastern side. These two sections were built in two phases: the western side (closer in the photo below) is from the early 13th C, while the eastern side was added later at the end of the 13th C.
The photo below shows the side entrance to the second level, with a spiral flight of stairs. A closer view of the spiral staircase is seen below. The north side of the church is seen below. Notice the different stones used in the older building (on the left side) and the newer side (the right side of the pillar). 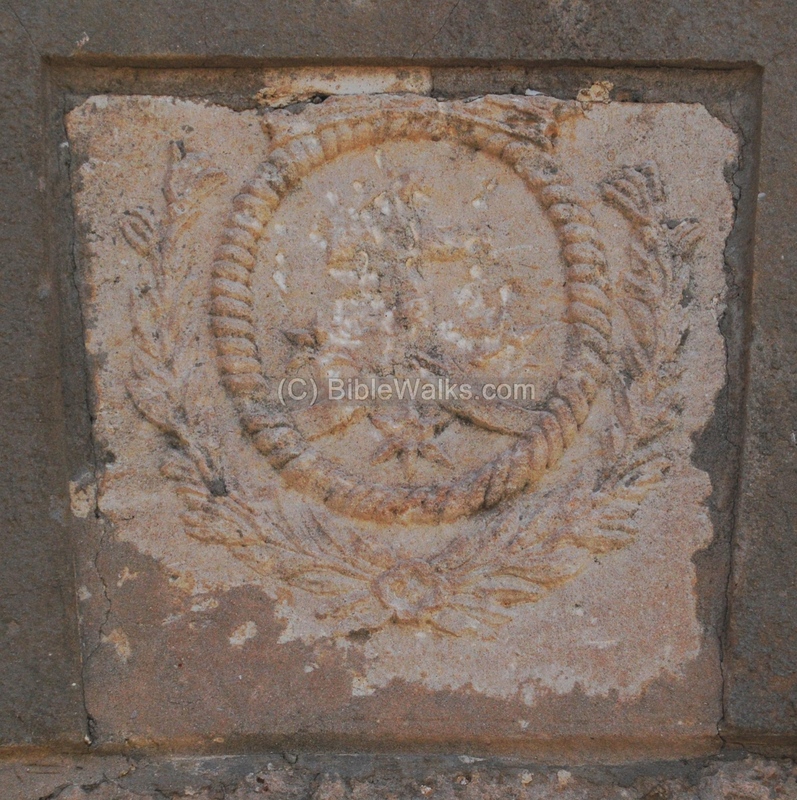 A closer detail of one of the stones that used to decorate the church. There are several of such stones with similar geometric grooves. 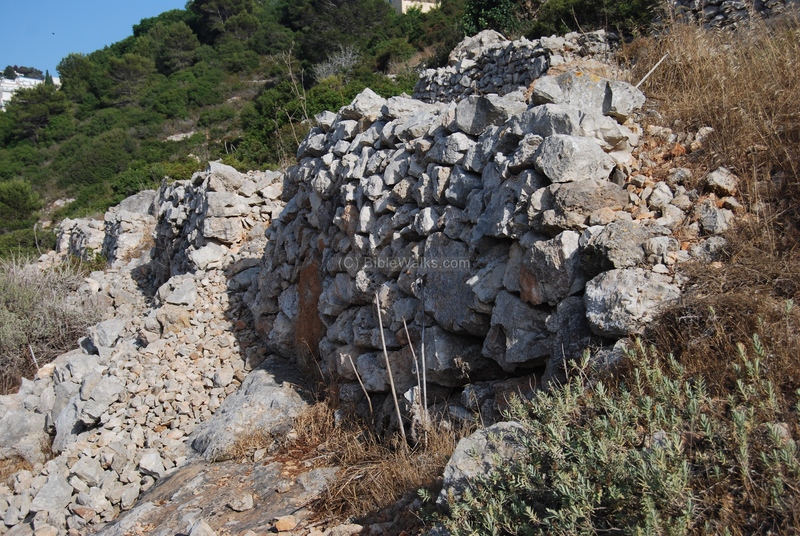 On the western side of the site are other structures of the monastery. The photo below shows a chapel built in the 17th C, when the Carmelite monks returned after approximate 400 years. The photo below shows the eastern door of the 17th C chapel. A detail of the inscription above the door is seen below. It is the symbol of the Carmelite order. 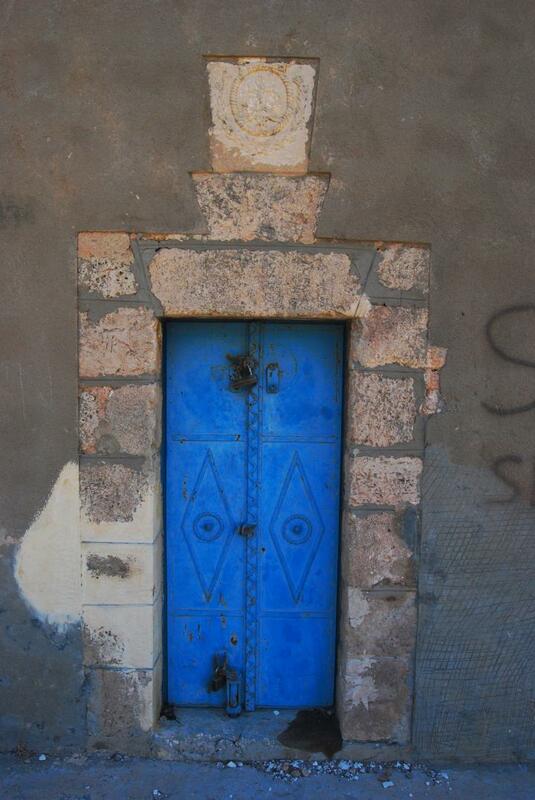 similar symbol, seen on the right, can be seen in Keren Carmel (Mukhraka), which is another Carmelite monastery. 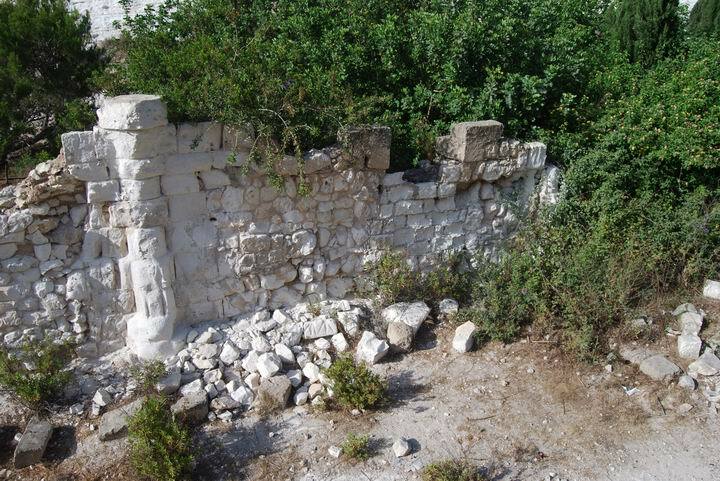 Behind the structure are more walls of the ruined buildings of the monastery. This section was constructed in the 17th C, and is a fortified monastery. Its massive walls and halls were built to protect the monks from raids, and avoid a repeated slaughter. A view of other sections of the structures on the western side. The steep slope seen below was actually a staircase. It allowed the monks to climb up or down from the church level to the bottom of the creek. The site started in the 12th C from a number of Crusaders who went to seclusion in the caves. There are several caves in the area near the church and the spring. The photo below shows one of these caves, located on the north side. This cave is called the "double-level" cave. On the first level, now sealed by a door, is where the animals were kept. In its walls are water and grain basins, feeding troughs and hooks. On the right side of the door is a ventilation hole. Rock hewn steps led up to the second level, which is seen in the large cavity above the lower level. Another cave is located on the south side, near the church. In the rock above it is another set of caves. When we visited the site, a young man was living in the cave above - perhaps a sort of modern hermit. About 30M to the east of the church, behind the trees, is the "Meshotetim" (hikers) spring, which is a translation of the Arabic name of the brook. According to Arabic traditions, the spring has healing powers (and is called el-Faraj - the salvation spring), and sick people came to bath in its waters. 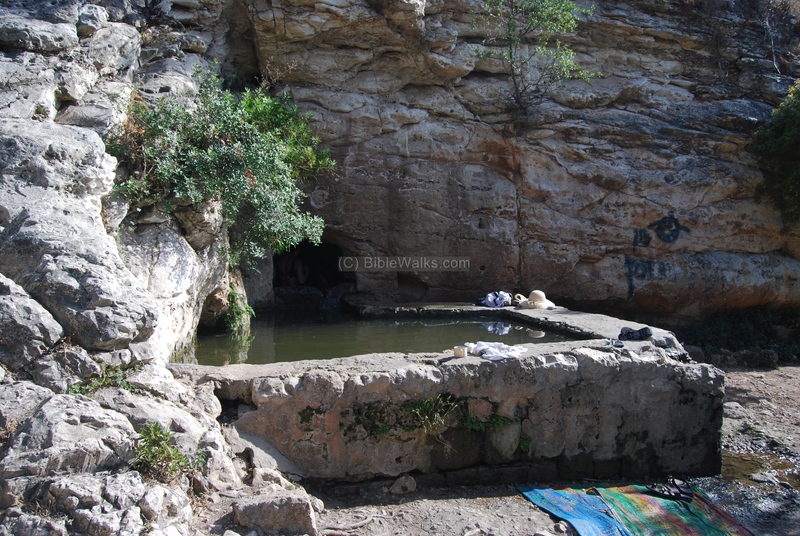 According to Carmelite tradition, prophet Elisha (known for his healing powers) drank from its waters and therefore they call it Elisha's spring. Another tradition tells that the cave was the residence of prophet's Elijah place (1 Kings 19:9: "And he came thither unto a cave, and lodged there"). 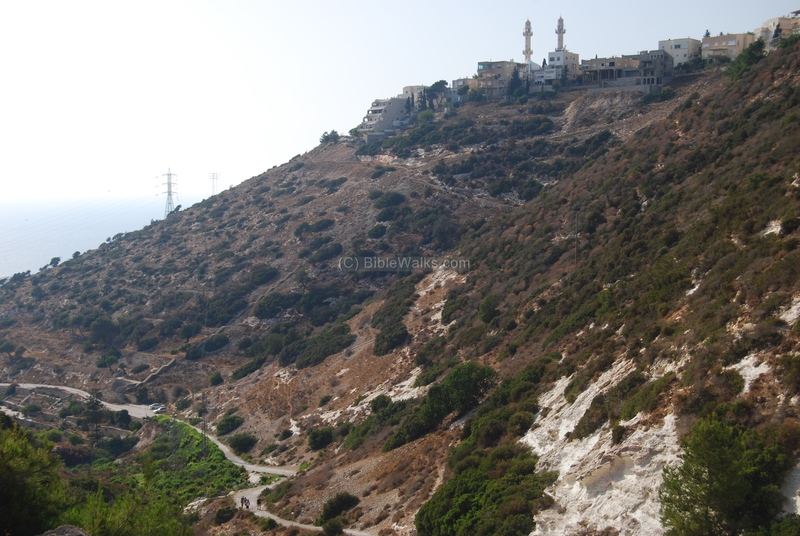 There are many sites in Mount Carmel that relate to the prophet, who was Elisha's predecessor and mentor, such as Elijah's cave which is located several KM to the North. The waters in the spring are collected in a rectangular stone pool, built in the 1960s, and were used for bathing and watering the herds. The water were also diverted with a small aqueduct to water the small orchard and provide drinking water to the Monastery. A closer view of the pool. 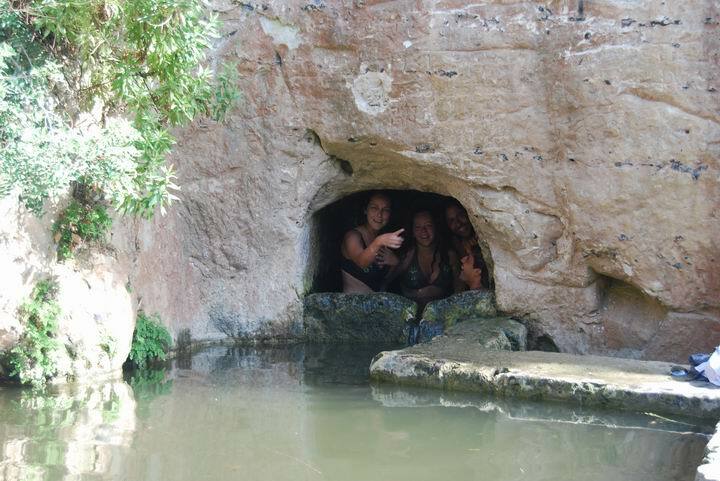 The water flows out of a small cave, filling up the pool. The aqueduct is located on the bottom of the rock, and the waters flow down towards the church. On the surface of the rock, above the pool and aqueduct, are inscriptions - mostly in Arabic. A group of bathers came to refresh themselves in the hot late spring. 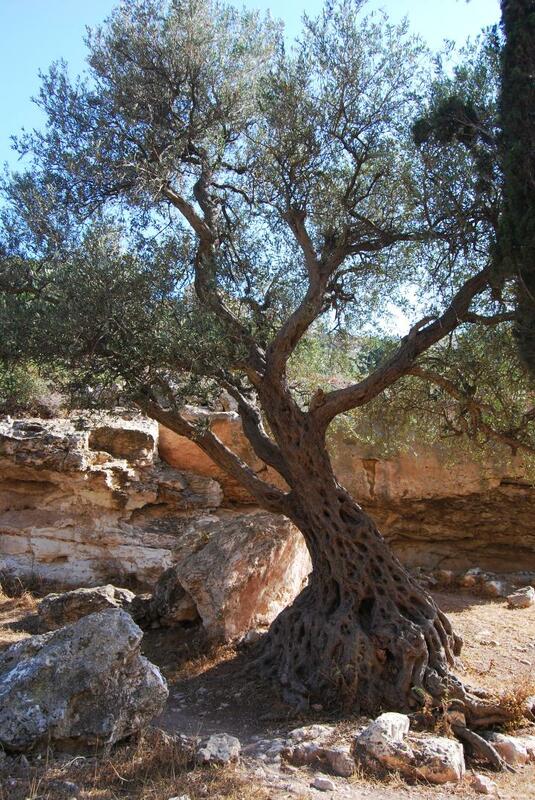 Near the spring is an orchard, including this incredible ancient olive tree, perhaps the original tree planted during the Crusader period. On both sides of the site are steep slopes of the hills around the brook. 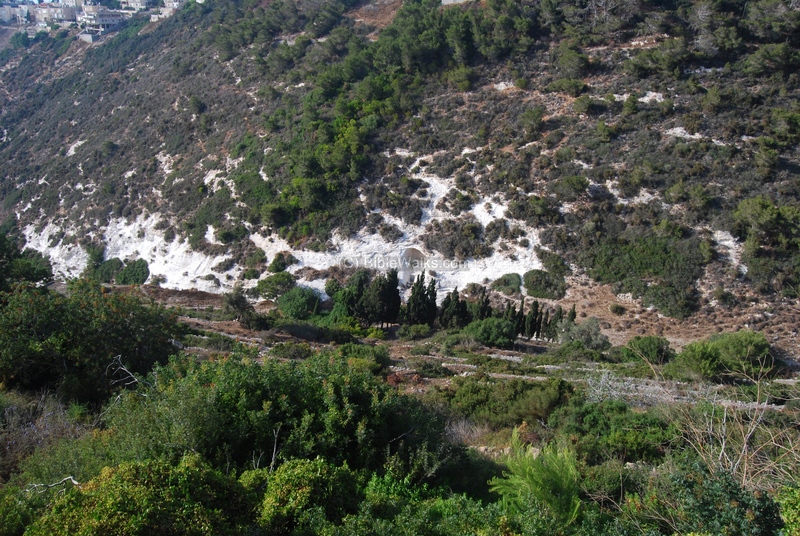 The photo below shows the north and west slopes. The sea is seen on the far left background. The double tower mosque seen in the background is located in Kababir, which is a mosque servicing the Ahmedi sect of Islam (built in the late 1970s). A long staircase (310 steps!) is seen on the slopes under the mosque. 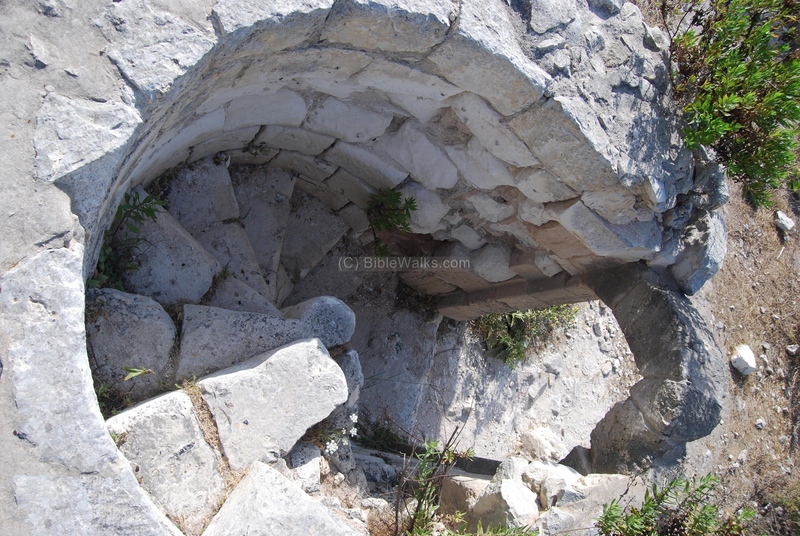 Near the bottom of the staircase is another larger spring - Siah spring - which is enclosed by a ruined modern structure, with a pumping station that used to pump water to the Carmel. The next photo shows a closer view of the the ancient agriculture terraces on the south hillside. Another view of the terraces. The crops used to have been planted behind it, and the product sold or used by the monks. An ancient staircase was used to climb up the terraces, leading to the top of the hill (a climb from 100M above sea level on the bottom of the brook - up to 220M on the top of the hill). A nature trail leads up the canyon towards the east. During most of the year the brook is dry. Along the south side of the dry bed is a long wall. A view of the ruins from the east side. Further higher up the Carmel the trail is narrower and the bush is thicker, as seen below. The trail is marked with a double-white-and-black strip. It takes about 20 minutes to walk the trail. The article was published on Feb 12, 1883 in the New York "Sun" with the title "The valley of the Martyrs", where he tells his readers about his visit to the site. We recommend to read from this chapter, and others, in this charming book (you can buy it). The name of the site, "the valley of the Martyrs", was dedicated to the hermits that were butchered by Arab armies in 1238. Their bodies were piled up in the pool of the spring on the west side of the brook. According to L. Oliphant, the number of the dead was so high since the St. Brocard monastery hosted many refugees assembled from other churches across the land. After this massacre, the spring went dry. It returned to give water again only after fellow Christians gave them a proper burial. 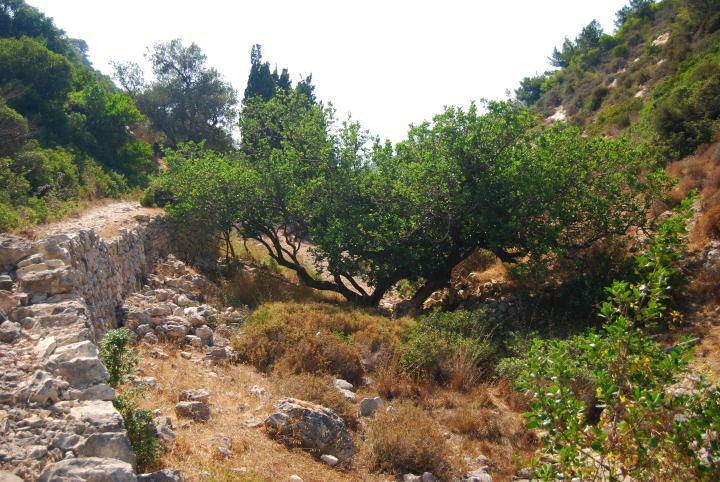 Laurence also described the hill above the site, called the garden of Elijah, where stones nicknamed "Elijah's watermelons" can be found (they are also found in other sites in Israel, as seen below). These stones are quartz balls, in different colors and sizes - ranging from golf ball sizes up to large melons. If the stone is broken it has a colored inner texture. According to tradition, the prophet Elijah - which is the Carmelite's primary saint - came one day to one of the orchards at this site and requested some fruits. 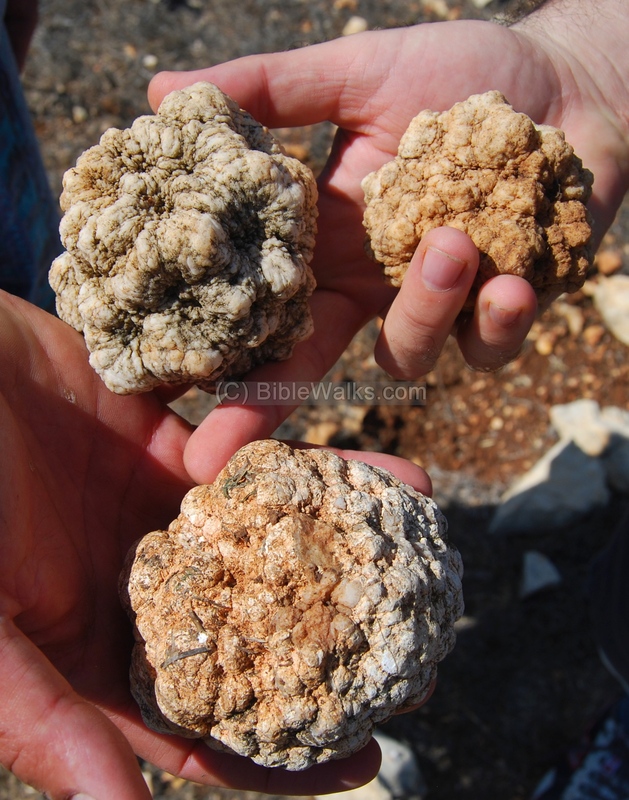 The owner refused, telling the prophet that these round balls are stones and not fruit. So Elijah - in his famous fury - cursed the orchard, turning all the fruits to stone for eternity. Carmelite monastery - The Carmelites established the Monastery in the 17th C, in Stella Maris. Siah - in Hebrew: Bush. The name is based on the Arabic name of the brook - Siaha (which in Arabic means "hike" - since the place was a trek point). Meshotetim - Hebrew: hikers, wanderers. 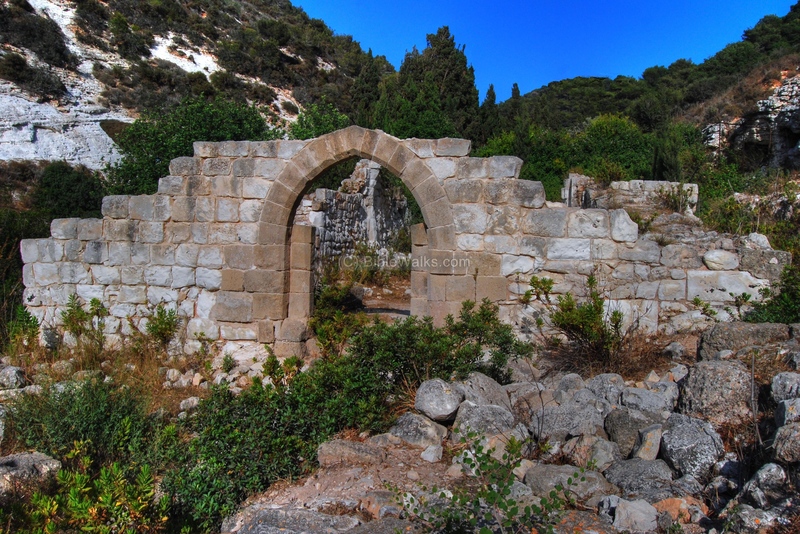 The name of the spring near the ruins of the church, based on the Arabic name of the brook (Siaha). Wadi - Arabic: brook, creek, valley.